Treadmill interval training is intense workout which is designed to make you stronger, faster walker or runner. This type of workout burns more calories in less time and really boosts your endurance. Treadmill interval training is a greatworkout for all levels of fitness. Interval training is usuallyconsists ofworking out different machines such as stationary bikes, ellipticaltrainer andtreadmill. This type of workout is usually suited for gym training asyou haveaccess to varieties of different fitness equipments. However interval workout can be done on treadmill alone, by performing different types of workouts such as treadmill cardio training, treadmill hill workout, fast walking and running. Walking and running on treadmill every single day can be boring, to beat treadmill boredom, your workout program should include treadmill interval workout. Since interval workout is high intensity and complex, it is advisable before you start any treadmill interval training to consult with your personal trainer or physician. Interval training is flexible it can work with any activity you choose how long and how hard your work during intensity intervals. Treadmill interval workoutconsists of different types of workout e.g. walking, running, hillworkout, speed training and dumbbell workout. It is not repetitiveendurance exercise; therefore the likelihood of getting injured isless. Interval trainingburns more calories than any other workout. Unlike other workouts interval training is not boring at all in fact it is entertaining and fun. The exercise consist of short workouts of different types of exercises, there is no repetition, making your workout as enjoyable as possible. This Video illustrates what is the best way to do High Intensity interval training. Consult with your doctor and physician before attempting any interval training. Treadmillinterval workout will help you develop a better sense of pace and learn to deal with hills more efficiently; it may help you set some new personal records when you return to the road. Intervals fast walk, run, hill workout, each workout time of 5 minutes for a total of20 to 30 minutes. If you want to run hills, crank up the speed to your best 5 or 10 kilometer pace and slowly increase the incline.Remember this is only an example the intensity of the workout varies from person to person depending on fitness level consult with your trainer. Cool down: 5 to10 minutes of easy jogging or walking, or until heart rate falls below55 percent of maximum. Treadmill Interval Trainer is very effect in burning calories, building endurance, improving your fitness level and most of all it burns fat faster than any other treadmill workout routine. 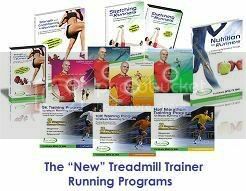 Treadmill trainer is the best treadmill workout program ever, if you ever wanted to have your own personal trainer helping, guiding, motivating and encouraging you every step of the way than treadmill trainer is might just be the treadmill interval workout program you wanted.